>> Is Our Focus on Bullying Producing More Victims? 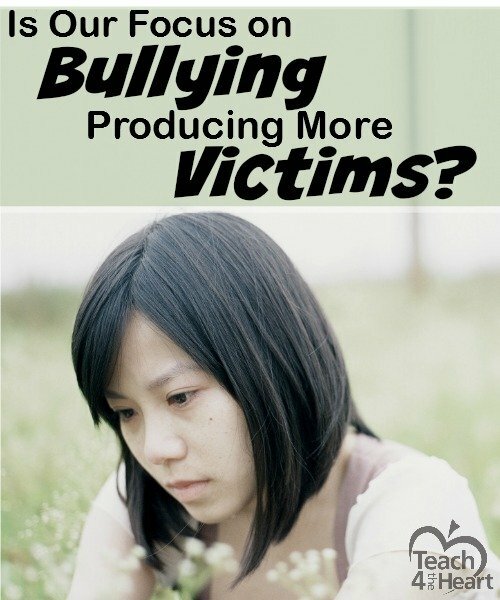 Is Our Focus on Bullying Producing More Victims? Before I get too far, let me make one thing crystal clear. There are no if‘s, and‘s, or but‘s about it. Kids should not harass, hurt, or make fun of other kids. It’s simply not right. And since it’s not right, we as teachers definitely should be on the lookout for bullying. We should deal with it firmly when it happens and do all that we can to prevent. But having said all that, I have to say that I have a major concern with the direction all this anti-bullying focus is taking. Because it seems like it’s producing a terrible byproduct – victims. Are We Producing a Victim Mentality? I’m thinking of the kids who are moping around feeling sorry for themselves because they are bullied. They are being picked on, and there’s just nothing they can do. Except tell the teacher – then she can also feel sorry for them and and hopefully stop the bullying. But there’s a few problems with this. I’m just wondering if we should start spending just as much time teaching students how to correctly handle being bullied as we do trying to eliminate bullying. First of all, bullying isn’t going anywhere. Now don’t get me wrong. I’ve already said we can and should do everything we can to prevent it and to disrupt it. But the reality is that there will always be bullies. It’s just part of life. And I’m just wondering if we should start spending just as much time teaching students how to correctly handle being bullied as we do trying to eliminate bullying. Which brings me to the second problem – feeling sorry for ourselves doesn’t help anything. Sure, a good pity party feels good for awhile, but in the end it solves nothing. And I’m concerned that students – having heard so much about how bad bullying is – when they are bullied (whether it be real bullying or just general teasing) quickly develop a “woe is me” attitude and label themselves a victim of bullying. And I’m sorry, I’m just not okay with that. When a student views himself as a victim (and we stand by and allow it), it robs him of the opportunity to learn from the experience. To learn how to respond gracefully in the midst of adversity. To learn how to stand up for himself without being a bully as well. To develop strength of character and resilience. To realize that maybe they themselves are contributing to the problem. I’m thinking, for example, of “Brad,” a middle schooler who is being picked on by some students in his class. He feels like he is being bullied and is tired of it. His mom is very concerned and feels his teachers aren’t doing enough to stop the teasing. Brad ends up crying all the time about it and wants to escape the bullies by transferring to the local public school instead of the private Christian school he currently attends. Nevermind that Brad himself isn’t always nice to his classmates. Or that he gets upset easily. Or that he is, in general, super hyper and loves to do silly things to get attention. He is being bullied and he doesn’t like it. Okay, now aren’t there a few problems here? Now as I said – his classmates are absolutely wrong to pick on him and make fun of him. But this is middle school – it’s gonna’ happen. My concern for Brad is that he’s going to switch schools in a desperate attempt to escape the bullies only to find himself in the exact same (but actually probably much worse) situation in the local public school. You see, the answer here isn’t just trying to stop the other kids from making fun of Brad. Yes, it should stop. But what Brad really needs is for someone to sit down with him and help him learn how to be a victor instead of a victim. Someone needs to talk to him about how there will always be bullies. Someone needs to let him know that if he’s gonna’ choose to be crazy, kids might make fun of him for being crazy. Someone needs to teach him how to go to his classmates and talk to them about the issue. Someone needs to teach him how to rise above and become a better person through this tough situation. I could go on and on, but I don’t want to write a book here. I guess I’m just trying to shine a spotlight on the other side of the bullying issue. We need to do more to teach our students how to respond to being bullied – and I mean way more than teaching them to tell an adult. And we especially need to help them learn how to deal with interpersonal issues that they perceive as bullying but are actually just normal personality conflicts that we all face. I don’t have all the answers, but I do think it’s time we start a conversation. So what do you think? Are we failing the “victims” of bullying? How can we better help them rise above the difficulties and become victors instead of victims? I agree! Bullying seems to be the buzzword of the day. Kids think all kinds of behavior is bullying – many which really are just those personality conflicts. It seems to be popular term to use these days. I have a thought, stick to classroom management. Clearly, you are in over your head with this topic. Just wow. No way are you in over your head. You have hit the nail on the head. Please don’t take her remarks out of context. Students do crazy, wild, silly antics all the time and what she means ‘if he’s gonna choose to be crazy, kids might make fun of him’ is that when a students chooses to draw attention to themselves, they can’t then be upset that people are paying attention to them. I agree that children need to be taught HOW TO DEAL with it. Not everyone will like you in life. That’s reality. I totally agree!! My teachers son made horrible choices as a teenager, and was bullied for them. He’s 24 now, and thinks that life needs to be handed to him on a platter because he was bullied. All she talks about now is how he is “forever bullied” and can’t get his life together because of that. I think at some point we were all bullied. However, at one time we were bullies ourselves. Most animals go through the ‘king of the hill’ stage where they assert themselves physically. As humans, we add language to the mix. It is another way children seek to master their peers (or the ‘pack’ if you will). Socialization is part of our job as adults, to teach ALL children how to actively participate in society. Bullies AND victims. Neither role is acceptable, and we need to teach them how to handle it better. I agree that the current ‘woe is me’ attitude is damaging not only to the child, but to society as a whole. How, as adults, will these children handle taking orders from a boss, being the topic of office gossip, or being in a position of authority? Thank you for opening up the topic! LOVE this post! I do think the word bully is overused right now. Students and parents yell “bully” at many instances of one-time disagreements or teasing that is meant to be in fun. We teach our students to do one of three things: walk away, ask them to stop, or tell a teacher. I’m not saying that’s the perfect, but at least it’s a start. I’m looking forward to reading more of this discussion. Hi! I just wanted to respond to a commenter who left a disagreeing comment a few days ago on this post. I was unable to approve the comment due to its explicit language (we do not allow any explicit language on this site). However, I want you to do know that your comment was not ignored. I’m sorry that this article has upset you, but you are not understanding my intent or my point. I have been abundantly clear that bullying is wrong and should be prevented as much as possible. Neither am I victim shaming. Nor am I enabling. What I am doing is calling out something that might be missing in the conversation. We can both condemn bullying & also help those who are being bullied not be victimized by their experience. This is especially relevant when we are speaking to/with Christ followers (I’m not sure if you are one or not, so I’m not sure how much this will make sense…) But as Christ followers, we know our worth is not found in what people think of us but is found in Christ and Him alone. We can be at peace regardless of what people think or say or how they judge (or misjudge) us – because we know we are loved and accepted by God and He is the only one we need. There is TREMENDOUS value in learning that truth. It produces a true confidence that cannot be shaken by what others do – thus providing true freedom from bullying for life. That’s a skill I believe is worth helping kids achieve – that’s all I’m saying.